Philadelphia employees continue to support their community by volunteering and lending a hand to MANNA. MANNA, which stands for Metropolitan Area Neighborhood Nutrition Alliance, was founded in 2006 and acts as a heroic firefighter for the chronically ill. The non-profit organization cooks and delivers nutritious, medically-appropriate meals to people who are battling life-threatening illnesses, from breast cancer to colon cancer and AIDS. 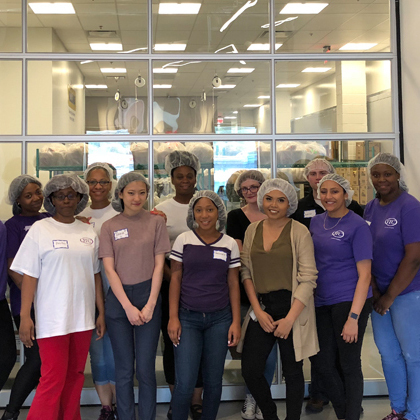 QTC volunteers spent one morning preparing and packaging more than 650 meals to be delivered to hundreds of Philadelphians. “Everyone was energized and displayed great teamwork with supporting the cause and completing the task. As we continue to support our veteran’s we also reach out to our local community to support them as well,” said Kimberly Alcorn (Operations Support Analyst). To all participants, thank you for your generosity and community involvement. Read more about the other volunteer efforts by the QTC team here.